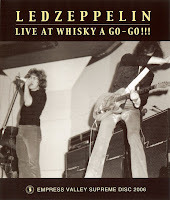 1/5/1969 Los Angeles, CA Live at Whisky A Go-Go!!! Second listening for this (I listened to it yesterday during the run as well) on computer speakers while working. Sound for this is pretty good considering the age. Starts a bit rough but gets better quickly. All songs are impressive in this set. Plant's vocals are a bit soft, but the rest of the sound is solid. There seems to be some tape bleed, can hear some other music in the quiet parts. This version is 52:11 in length. Better late than never! The tape sounds much better than the mess that is 12/30/68! The performance is much better too. Hopefully more of these Whiskey shows show up. Lemon Song/Killing Floor is my favorite tune of the whole set. Its nice to hear a clearer version of "For Your Love" too. Considering these audio recordings are going to be close to 50 years old: The Whiskey tapes from 1-5-69 aren't too bad.